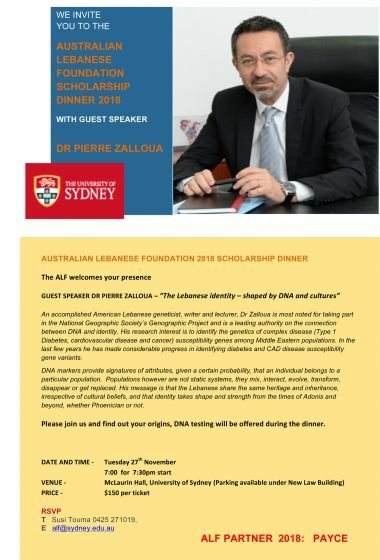 Dr Pierre Zalloua is a geneticist with a primary focus on population and public health research, currently investigating genetic and other determinants of coronary artery disease and Type 2 Diabetes. He also have a special interest in evolutionary genetics, in particular, researching the origins' and the genetic make up of today's and ancient Levantine populations. His contributions to biology include numerous researches in genetic predisposition to diseases such as type 1 diabetes and β-thalassemia. He is most noted for taking part in the National Geographic Society's Genographic Project. Pierre was born in Zgharta on February 9, 1965. He obtained his Biology degree from the American University of Beirut in 1987 and a Genetics master's degree from the San Jose State University in California in 1990. Pierre worked on his Doctorate degree in genetics from the UC Davis between 1990 and 1996 and graduated in 1996. Pierre was appointed Dean of Graduate Studies and Research in 2013. His past engagements with LAU include Dean of the School of Pharmacy from October 2012 to September 2013 and Professor of Genetics at the School of Medicine. He joined LAU in 2007. He also holds the position of Adjunct Professor of Environmental Health at the Harvard School of Public Health. An accomplished geneticist, writer and lecturer, Dr. Zalloua is a leading authority on the genetics of complex diseases in and among Middle Eastern populations. Much of his recent investigative studies have addressed molecular anomalies observed in people with Type 1 diabetes and coronary artery disease (CAD). His research interest is to identify complex disease (Type 1 Diabetes, cardiovascular disease and cancer) susceptibility genes, to study their interaction with the environment, and to correlate these interactions with disease onset and manifestation. In the last few years, he has made considerable progress in identifying diabetes and CAD disease susceptibility gene variants. Dr. Zalloua has also conducted extensive research on the genetic links between various Middle Eastern and Mediterranean populations. Recently, he has started to work in the field of population patterns of human migrations using DNA. He is currently leading an investigative team that will obtain DNA samples from indigenous populations in the Middle East and North Africa to study their genetic commonalities. This study is part of what is known as the Genographic Project (a grant from the National Geographic Society, 2006–2010). He was also the principal investigator for the FGENTCARD Project, a European Union research project (2007–2009). Dr. Zalloua graduated from the American University of Beirut in 1987 with a B.S. in Biology. He earned his M.A. in Biological Sciences from San Jose State University in 1990, and his Ph.D. in Genetics from the University of California, Davis in 1996. He completed research fellowships in genetics at the University of California, Davis (1996–1997), in molecular biology at Applied Biosystems (1997–1998), and in population genetics (1998–2001) at the Harvard School of Public Health. He was an Assistant Professor, and then Associate Professor in the school of medicine at the American University of Beirut between 2003 and 2007.